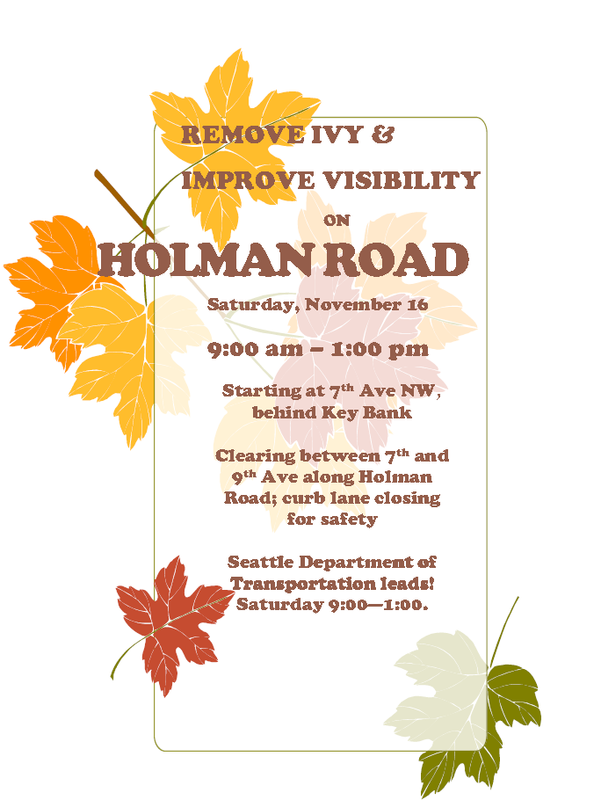 You are receiving this e-mail as a subscriber to the Holman Road NW Paving Project updates. Due to weather, paving work that was originally scheduled for tonight, Monday June 16, has been rescheduled to this Thursday, June 19. Crews will begin work in the westbound lanes of Holman Road NW between 7th Avenue NW and Greenwood Ave N from 8 PM on Thursday, June 19, until 6 AM Friday, June 20. During this time, traffic will be shifted to the eastbound lanes of Holman Road NW, with one lane open in each direction. Grinding and paving work will then switch to the eastbound lanes of Holman Road NW, and traffic will be shifted to the westbound lanes of Holman Road NW, where one lane will be open in each direction. Crews are scheduled to begin closing eastbound lanes for grinding the night of Wednesday, June 25 at 8 PM. Grinding will be noisy and is expected to last until 6 AM, Thursday July 26. Nighttime paving in the eastbound lanes will begin Wednesday, July 2, and is expected to be complete the following day, Thursday, July 3. Paving is weather dependent, and these dates are subject to change. We will update you if there are any changes to the construction schedule. Local bus access will be maintained for King County Metro’s Route 28, 40 and RapidRide D Line. For information on bus service, look for Rider Alert notices at bus stops, see Metro Online, http://metro.kingcounty.gov/alerts, or call (206) 553-3000. Night time work on Holman Rd, June 9th and 18th, 8PM to 7AM. Be prepared for at least a couple of noisy nights on Holman as the contractors on the repave are going to be grinding down the concrete. This was received yesterday from Seattle Dept. of Transportation. More information on their website. You are receiving this e-mail as a subscriber to the Holman Road NW Paving Project updates. Crews finished repairing and paving the bridge this past weekend, and sidewalk work in Zone 1 (between 7th Avenue NW and Greenwood Avenue N) is nearly complete. Preparations are now underway for grinding and repaving all lanes of Holman Road NW in Zone 1. The westbound lanes of Holman Road NW between 7th Avenue NW and Greenwood Ave N will be closed at 8 PM on Monday, June 9, with grinding scheduled for that night. Grinding will be noisy and is expected to last until 5 AM the next day. Paving work will follow and is expected to be complete on June 17. During this time, traffic will be shifted to the eastbound lanes of Holman Road NW, with one lane open in each direction. Grinding and paving work will then switch to the eastbound lanes of Holman Road NW, and traffic will be shifted to the westbound lanes of Holman Road NW, where one lane will be open in each direction. Crews are scheduled to begin grinding the eastbound lanes the night of June 18, and paving is expected to be complete by June 27. This is a reminder that Holman Rd will be closed from 8 PM on Friday to 6 PM on Saturday. Full Closure of Holman Road NW: Holman Road NW will be closed to traffic in both directions between 9th Avenue NW and 7th Avenue NW from 8 PM on Friday, May 30, until 6 PM on Saturday, May 31, for bridge deck repairs. Drivers will be detoured via NW 85th Street and 3rd Avenue NW. Local bus access will be maintained during this closure. For the latest King County Metro updates, please visit http://metro.kingcounty.gov/alerts/. Help save nearly 200 trees from an ivy infestation! Join us from 9am to 1pm on Nov 9th. Help Crown Hill Business Association and our neighbors, as well as a safety and technical team from SDOT to save our street trees along Holman road and NW 86th. There will likely be a partial road closure for worker safety. SDOT staff will help! Many tools and gloves provided. Bring shovels and loppers and if you prefer your work gloves, bring those too. Meet at Crown Hill Park NW 92nd and 14th ave NW. If possible please RSVP to Catherine.Weatbrook@gmail.com so that we may better plan tools, project reach tab day, food, and beverages.